Want to share the presentation you made on your iPad with everyone in the office? Feel like playing Angry Birds on the big screen? Need to show the room how to use an app you have? The AirPlay function in iOS and Apple TV allows you to stream your iPad display directly to a TV screen, letting everyone see what your iPad is showing. Follow this guide to get it up and running in just a few minutes. 1.Check that you have a compatible devices. 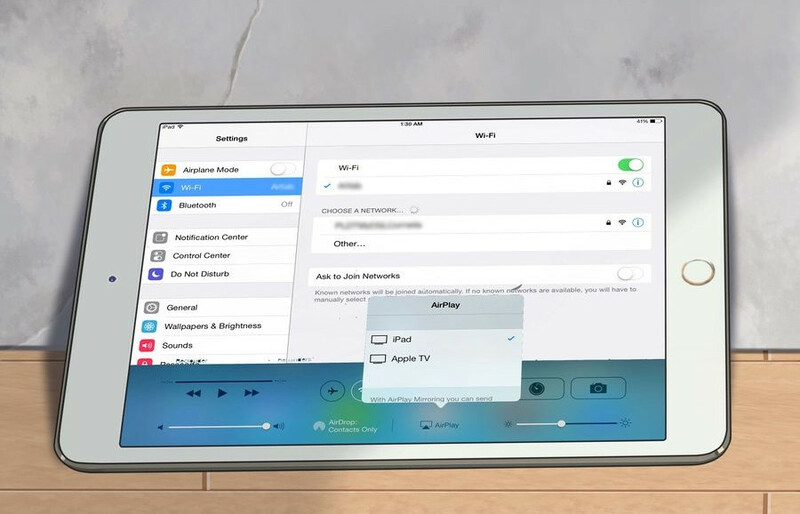 You must have an iPad 2 or newer, or an iPad Mini, in order stream using AirPlay. Your Apple TV must be second-generation or newer. * Second generation Apple TVs were released late 2010. 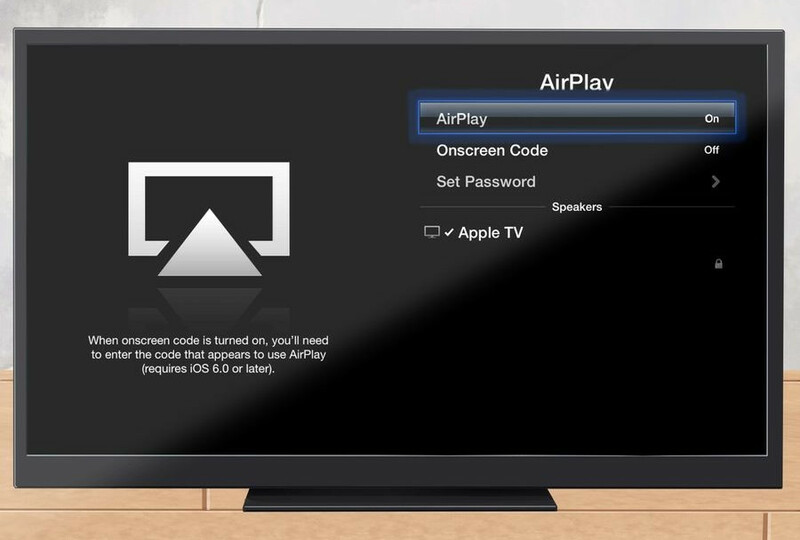 If your Apple TV is older, it will not support AirPlay. *　The iPad 2 was released in 2011. Original iPads will have a model number A1219 or A1337 and are not compatible. *　Ensure that both devices are updated to the latest version of iOS. This will ensure the highest-quality stream. 2. Turn on your TV and the Apple TV unit. Make sure that the TV is set to the input that the Apple TV is connected to. You should be able to see the Apple TV interface. *　Check the Settings menu of your Apple TV to make sure that AirPlay is turned on. 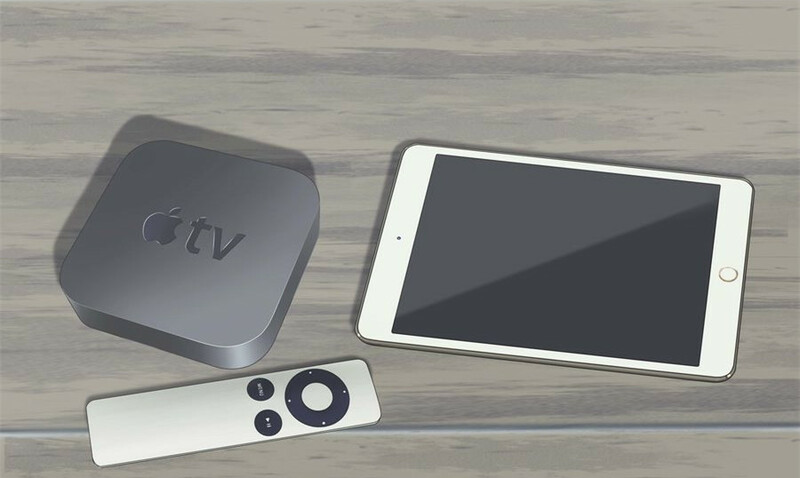 *　If you are using your Apple TV for the first time, this article will show you how to set it up. 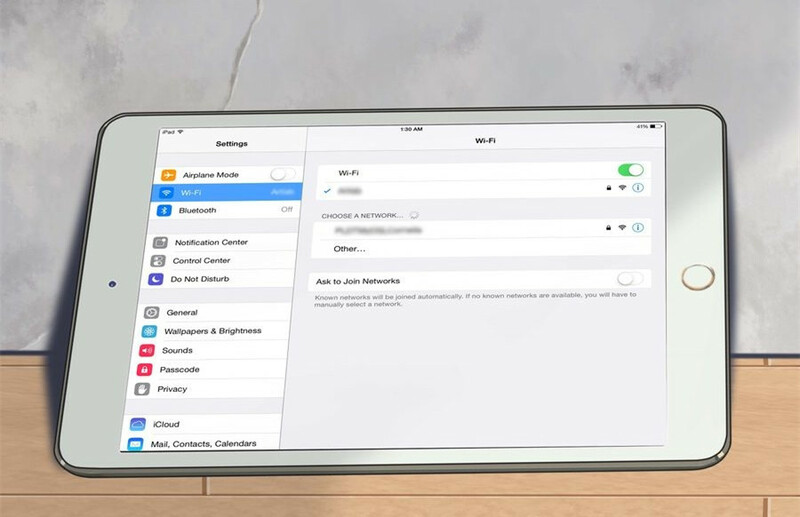 3.Connect your iPad to your home network. In order to stream your iPad to the TV screen, your iPad and Apple TV need to be on the same network. 4. Stream specific content to your TV. If you’d rather just stream a specific video or song to your TV, start the media on your iPad and then tap the AirPlay button. This button is located next to the “Next” button on your playback controls. Pressing the button will send the video or song to your Apple TV screen. 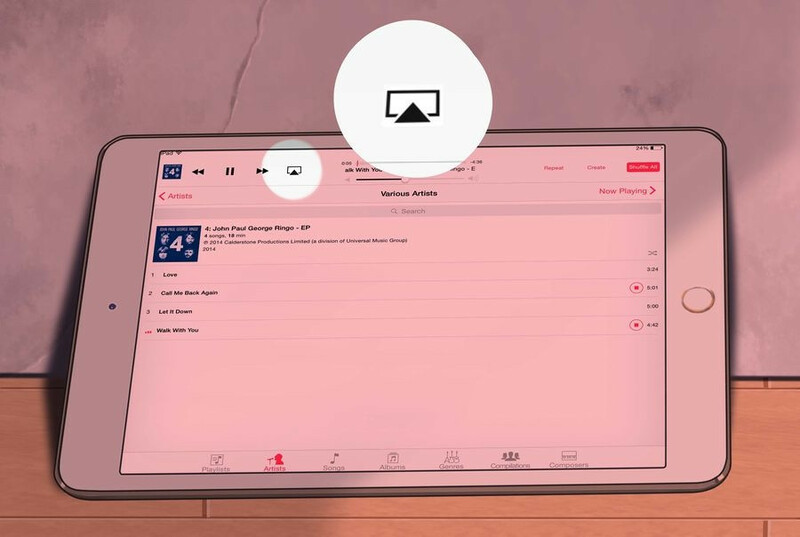 * When the content is streaming on the TV, you can use the controls that appear on the iPad to start and stop playback, skip to the next track, and more. If you are streaming pictures, swipe your iPad screen to move to the next picture. 5. 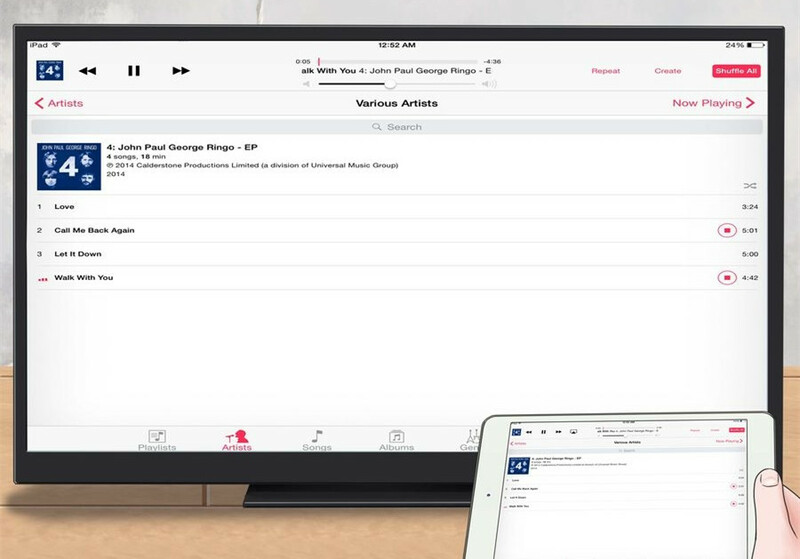 Stream everything on your iPad running iOS 9. If you’d rather stream your whole iPad screen to the Apple TV, swipe up from the button of the screen on your iPad to open the Control Center. Tap the AirPlay button and select your Apple TV from the menu that appears. Your iPad screen will now appear on your TV. * To access the AirPlay button on iOS 9, tap the Home button twice to open a list of your recent apps. Swipe from left to right to open the brightness menu. Tap the AirPlay button and select your Apple TV from the menu that appears. 6.Decide if you want to enable mirroring. Mirroring will show your display on both screens. If mirroring is not enabled, the display will only appear on the TV. Mirroring is especially useful for giving presentations, or for playing iPad games on your TV. * To turn on Mirroring, toggle the switch so that it turns green (iOS 9). The new Apple TV changes all of that: while now branded “tvOS,” the software and interface of new product is now much closer aligned to other iOS products, with a Home button that returns the user to a launch screen of apps, including support for an official App Store with third party titles. Users can buy and install apps, switch between them and terminate running apps largely the same way they’d do those tasks on an iPhone or iPad. There are, however, some significant differences between iOS and the new tvOS, necessitated by the fact that TVs are installed across the room rather than being a display users directly manipulate via touch.